Li, Y., Marty, B., Shcheka, S., Zimmermann, L., Keppler, H. (2016) Nitrogen isotope fractionation during terrestrial core-mantle separation. Geochem. Persp. Let. 2, 138-147. The origin and evolution of the terrestrial nitrogen remains largely unresolved. In order to understand the potential influence of core-mantle separation on terrestrial nitrogen evolution, experiments were performed at 1.5 to 7.0 GPa and 1600 to 1800 °C to study nitrogen isotope fractionation between coexisting liquid Fe-rich metal and silicate melt. The results show that the metal/silicate partition coefficient of nitrogen DNmetal/silicate ranges from 1 to 150 and the nitrogen isotope fractionation Δ15Nmetal-silicate is −3.5 ± 1.7 ‰. Calculations show that the bulk Earth is more depleted in δ15N than the present-day mantle, and that the present-day mantle δ15N of −5 ‰ could be derived from an enstatite chondrite composition via terrestrial core-mantle separation, with or without the addition of carbonaceous chondrites. These results strongly support the notion that enstatite chondrites may be a main component from which the Earth formed and a main source of the terrestrial nitrogen. Moreover, in the deep reduced mantle, the Fe-rich metal phase may store most of the nitrogen, and partial melting of the coexisting silicates may generate oceanic island basalts (OIBs) with slightly positive δ15N values. Figure 1 Nitrogen partition coefficients between liquid Fe-rich metal and silicate melt (DNmetal/silicate). The published DNmetal/silicate data (Kadik et al., 2011, 2013; Roskosz et al., 2013) are plotted for comparison. DNmetal/silicate is a function of oxygen fugacity, regardless of pressure or temperature. The slope of the trend line is moderately lower than 0.75 expected based on Eq. 1, which could be due to a small fraction of nitrogen present as N2 in the silicate melt. Errors of DNmetal/silicate in this study are at 95 % confidence interval. Table 1 Experimental results on nitrogen partitioning and isotope fractionation between liquid Fe-rich metal and silicate melt. Figure 2 Nitrogen isotope fractionation between liquid Fe-rich metal and silicate melt (Δ15Nmetal-silicate). 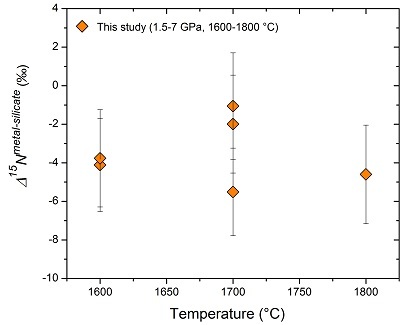 Temperature has a very limited effect on Δ15Nmetal-silicate in the P-T range studied. Errors of Δ15Nmetal-silicate are at 95 % confidence interval. 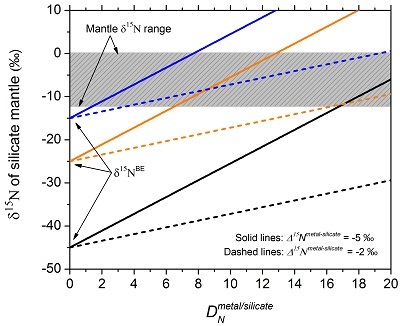 Figure 3 The modelled δ15N value of the silicate mantle as a function of DNmetal/silicate, just after complete core-mantle separation, using the Rayleigh distillation model (Eq. 5) and the relationship between ƒNmantle and DNmetal/silicate (Eqs. 6 and 7). Three different δ15NBE values are used: the lowest value (−45 ‰) is the lowest value observed so far for Earth’s mantle and enstatite chondrites (Grady et al., 1986; Palot et al., 2012); the values of −25 ‰ and −15 ‰ correspond to the average and highest δ15N values of enstatite chondrites (Grady et al., 1986), respectively. Two different values of −2 ‰ and −5 ‰ are used for the dashed lines and solid lines, respectively. The gray box represents the main range of δ15N values observed for the silicate mantle (Marty and Dauphas, 2003; Palot et al., 2012; Cartigny and Marty, 2013), which may be produced from the average nitrogen isotopic composition of enstatite chondrites by core-mantle separation with DNmetal/silicate between 5 and 20. Table S-1 Major and minor element contents in silicate melt and liquid Fe-rich metal (in wt. %). Javoy, M. (1997) The major volatile elements of the earth: Their origin, behavior, and fate. Geophysical Research Letters 24, 177-180. Marty, B., Dauphas, N. (2003) The nitrogen record of crust-mantle interaction and mantle convection from Archean to Present. Earth and Planetary Science Letters 206, 397-410. Cartigny, P., Marty, B. (2013) Nitrogen isotopes and mantle geodynamics: The emergence of life and the atmosphere–crust–mantle connection. Elements 9, 359-366. Thomazo, C., Papineau, D. (2013) Biogeochemical cycling of nitrogen on the early Earth. Elements 9, 345-351. Shen, Y., Solomon, S.C., Bjarnason, I.T., Wolfe, C.J. (1998) Seismic evidence for a lower-mantle origin of the Iceland plume. Nature 395, 62-65. Stuart, F.M., Lass-Evans, S., Fitton, J.G., Ellam, R.M. (2003) High 3He/4He ratios in picritic basalts from Baffin Island and the role of a mixed reservoir in mantle plumes. Nature 424, 57-59. Dauphas, N., Marty, B. (1999) Heavy nitrogen in carbonatites of the Kola Peninsula: A possible signature of the deep mantle. Science 286, 2488-2490. Palot, M., Cartigny, P., Harris, J., Kaminsky, F., Stachel, T. (2012) Evidence for deep mantle convection and primordial heterogeneity from nitrogen and carbon stable isotopes in diamond. Earth and Planetary Science Letters 357, 179-193. Cartigny, P., Farquhar, J., Thomassot, E., Harris, J., Wing, B., Masterson, A., McKeegan, K., Stachel, T. (2009) A mantle origin for Paleoarchean peridotitic diamonds from the Panda kimberlite, Slave Craton: evidence from 13C-, 15N-and 33,34S-stable isotope systematics. Lithos 112, 852-864. Li, Y., Wiedenbeck, M., Shcheka, S., Keppler, H. (2013) Nitrogen solubility in upper mantle minerals. Earth and Planetary Science Letters 377, 311-323. Grady, M.M., Wright, I., Carr, L., Pillinger, C. (1986) Compositional differences in enstatite chondrites based on carbon and nitrogen stable isotope measurements. Geochimica et Cosmochimica Acta 50, 2799-2813. Kerridge, J.F. (1985) Carbon, hydrogen and nitrogen in carbonaceous chondrites: Abundances and isotopic compositions in bulk samples. Geochimica et Cosmochimica Acta 49, 1707-1714. ). If this is correct, then one open question is how the Earth’s nitrogen isotopes evolved from the initial δ15N values of enstatite chondrites to the present-day mantle value of −5 ‰ and the positive values observed for OIBs. Roskosz, M., Bouhifd, M., Jephcoat, A., Marty, B., Mysen, B. (2013) Nitrogen solubility in molten metal and silicate at high pressure and temperature. Geochimica et Cosmochimica Acta 121, 15-28. ). However, so far the potential influence of core-mantle separation on Earth’s mantle nitrogen isotope evolution has never been investigated. Here we experimentally show that a significant nitrogen isotope fractionation occurs between liquid Fe-rich metal and coexisting silicate melt, and terrestrial core-mantle separation may have greatly enriched the silicate mantle in δ15N. 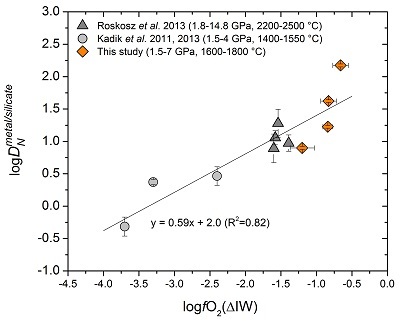 Kadik, A., Kurovskaya, N., Ignat’ev, Y., Kononkova, N., Koltashev, V., Plotnichenko, V. (2011) Influence of oxygen fugacity on the solubility of nitrogen, carbon, and hydrogen in FeO-N2O-SiO2-Al2O3 melts in equilibrium with metallic iron at 1.5 GPa and 1400 °C. 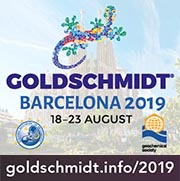 Geochemistry International 49, 429-438. Kadik, A., Litvin, Y., Koltashev, V., Kryukova, E., Plotnichenko, V., Tsekhonya, T., Kononkova, N. (2013) Solution behavior of reduced N–H–O volatiles in FeO–Na2O–SiO2–Al2O3 melt equilibrated with molten Fe alloy at high pressure and temperature. Physics of the Earth and Planetary Interiors 214, 14-24. Li, Y., Huang, R., Wiedenbeck, M., Keppler, H. (2015) Nitrogen distribution between aqueous fluids and silicate melts. Earth and Planetary Science Letters 411, 218-228. Häglund, J., Fernández Guillermet, A., Grimvall, G., Körling, M. (1993) Theory of bonding in transition-metal carbides and nitrides. Physical Review B 48, 11685-11691.
) and only a few hundred ppm nitrogen was present in our silicate melt, partial crystallisation during quench may not have caused exsolution of nitrogen. The observed systematic dependence of DNmetal/silicate on oxygen fugacity (Fig. 1) also precludes any significant exsolution of nitrogen during quench.
) are plotted for comparison. DNmetal/silicate is a function of oxygen fugacity, regardless of pressure or temperature. The slope of the trend line is moderately lower than 0.75 expected based on Eq. 1, which could be due to a small fraction of nitrogen present as N2 in the silicate melt. Errors of DNmetal/silicate in this study are at 95 % confidence interval. The measured nitrogen metal/silicate melt isotope fractionation Δ15Nmetal-silicate ranges from −1.1 to −5.5 ‰ (Table 1; Fig. 2), with a mean value of −3.5 ± 1.7 ‰, indicating 15N-enrichment in the silicate melt relative to the coexisting liquid Fe-rich metal. Within the analytical uncertainties, there is no apparent temperature dependence of Δ15Nmetal-silicate over the interval of 1600-1800 °C, which might be partially due to the covariation of pressure and temperature. The consistent Δ15Nmetal-silicate values from piston cylinder and multi-anvil experiments (Table 1) rule out the possibility that a significant change in Δ15Nmetal-silicate occurred during quench of the multi-anvil experiments. The nearly constant Δ15Nmetal-silicate values, independent on the run duration (30 to 120 mins; Table 1), also demonstrate that isotopic equilibrium was reached during the run and any kinetic fractionation should be within the analytical error. A-666 2.5 1700 30 n.d.
YS-1 7.0 1700 90 n.d.
a: The logƒO2(ΔIW) was calcualted using this equilibrium: FeO (silicate melt) = Fe (liquid metal) + 1/2O2, from which the ƒO2 of the experiment relative to ƒO2 of the iron-wüstite buffer (IW) can be defined as: ΔIW = 2 log (XFeOγFeO/XFeγFe), XFeO and XFe are the mole fractions of FeO in silicate melt and Fe in liquid metal, respectively; γFeO and γFe are the activity coefficients of FeO in silicate melt and Fe in liquid metal, respectively. Calculation of logƒO2(ΔIW) was performed assuming γFeO = 1.2 in the silicate melt (O'Neill and Eggins, 2002 O'Neill, H.S.C., Eggins, S.M. (2002) The effect of melt composition on trace element partitioning: an experimental investigation of the activity coefficients of FeO, NiO, CoO, MoO2 and MoO3 in silicate melts. Chemical Geology 186, 151-181. ) and ideal solution of liquid Fe-C-Pt-N metal (γFe = 1). For major element compositions of silicate melt and liquid metal, see Supplementary Table 1. Errors for DNmetal/silicate and Δ15Nmetal-silicate are at 95 % confidence interval. Li, J., Agee, C.B. (1996) Geochemistry of mantle-core differentiation at high pressure. Nature 381, 686-689. Righter, K. (2011) Prediction of metal–silicate partition coefficients for siderophile elements: An update and assessment of PT conditions for metal–silicate equilibrium during accretion of the Earth. Earth and Planetary Science Letters 304, 158-167.
is used, then the CNcore would be 4-16 ppm. Wood, B.J., Walter, M.J., Wade, J. (2006) Accretion of the Earth and segregation of its core. Nature 441, 825-832. Wood, B.J., Li, J., Shahar, A. (2013) Carbon in the core: its influence on the properties of core and mantle. 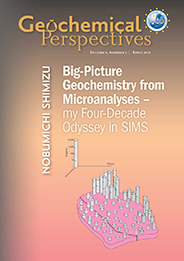 Reviews in Mineralogy and Geochememistry 75, 231-250. Horita, J., Polyakov, V.B. (2015) Carbon-bearing iron phases and the carbon isotope composition of the deep Earth. Proceedings of the National Academy of Sciences 112, 31-36. Krot, A.N., Keil, K., Scott, E.R.D., Goodrich, C.A., Weisberg, M.K. (2014) Classification of meteorites and their genetic relationships. Treatise on Geochemistry 1, 1-63. Rubie, D.C., Jacobson, S.A., Morbidelli, A., O’Brien, D.P., Young, E.D., de Vries, J., Nimmo, F., Palme, H., Frost, D.J. (2015) Accretion and differentiation of the terrestrial planets with implications for the compositions of early-formed Solar System bodies and accretion of water. Icarus 248, 89-108.
) assumes that during the early stages of accretion, the impacting objects are relatively small and their metal phase sequentially extracts nitrogen from the magma ocean according to a Rayleigh model; however, towards the end of accretion, large, differentiated planetesimals collide with the growing Earth. The cores of these large objects are in bulk equilibrium with their mantles, but due to their large size, they do not exchange nitrogen with the silicate magma ocean anymore. ), which may be produced from the average nitrogen isotopic composition of enstatite chondrites by core-mantle separation with DNmetal/silicate between 5 and 20.
, 80-100 % of the core-forming metal may have equilibrated with the silicate magma ocean according to the Rayleigh model. However, it should be noted that the resulting δ15Nmantle of ‒17 ‰ in the hybrid model above is still significantly lower than the present-day mantle δ15N of −5 ‰, which indicates a much reduced efficiency of the hybrid Rayleigh-equilibrium model in increasing δ15Nmantle compared to the pure Rayleigh model. Trinquier, A., Birck, J., Allègre, C.J. (2007) Widespread 54Cr heterogeneity in the inner solar system. The Astrophysical Journal 655, 1179. Regelous, M., Elliott, T., Coath, C.D. (2008) Nickel isotope heterogeneity in the early Solar System. Earth and Planetary Science Letters 272, 330-338. Javoy, M, Kaminski, E., Guyot, F., Andrault, D., Sanloup, C., Moreira, M., Labrosse, S., Jambon, A., Agrinier, P., Davaille, A., Jaupart, C. (2010) The chemical composition of the Earth: Enstatite chondrite models. Earth and Planetary Science Letters 293, 259-268. Frost, D.J., McCammon, C.A. (2008) The redox state of Earth's mantle. Annual Review of Earth and Planetary Sciences 36, 389-420. Frost, D. Liebske, C., Langenhorst, F., McCammon, C. (2004) Experimental evidence for the existence of iron-rich metal in the Earth's lower mantle. Nature 428, 409-412. Rohrbach, A., Schmidt, M.W. (2011) Redox freezing and melting in the Earth's deep mantle resulting from carbon-iron redox coupling. Nature 472, 209-212. Rohrbach, A., Ghosh, S., Schmidt, M.W., Wijbrans, C.H., Klemme, S. (2014) The stability of Fe–Ni carbides in the Earth's mantle: Evidence for a low Fe–Ni–C melt fraction in the deep mantle. Earth and Planetary Science Letters 388, 211-221. ), may therefore generate OIBs with very slightly positive δ15N values; however, generating OIBs with δ15N up to +8 ‰ may need the source region δ15N > +0 ‰. We thank Hubert Schulze for sample preparation. Y.L. acknowledges support from the Elite Network Bavaria (ENB) program. Constructive reviews by three anonymous reviewers and journal editor Bruce Watson helped to improve this paper. The present-day upper mantle δ15N, inferred from fibrous diamonds and mid-ocean ridge basalts (MORBs) is −12 to 0 ‰ and converges towards a globally uniform value of −5 ‰ (Marty and Dauphas, 2003; Cartigny and Marty, 2013). The δ15N value of the organic matter and metasediments is overall positive, and the δ15N value of Earth’s surface (crust + atmosphere) is approximately +2 ‰ (Cartigny and Marty, 2013; Thomazo and Papineau, 2013). Because enstatite chondrites have δ15N of −45 to −15 ‰ (Grady et al., 1986), while carbonaceous chondrites have δ15N of +15 to +55 ‰ (Kerridge, 1985), the extremely negative δ15N values down to −25 ‰ and −40 ‰ observed in a few mantle diamonds are interpreted to be relicts of primordial nitrogen and are used to argue for an enstatite chondrite origin of Earth’s nitrogen (Javoy, 1997; Palot et al., 2012; Cartigny and Marty, 2013). Figure 3 [...] The gray box represents the main range of δ:15N values observed for the silicate mantle (Marty and Dauphas, 2003; Palot et al., 2012; Cartigny and Marty, 2013), which may be produced from the average nitrogen isotopic composition of enstatite chondrites by core-mantle separation with DNmetal/silicate between 5 and 20. These results support previous models (Javoy, 1997; Palot et al., 2012; Cartigny and Marty, 2013) that assumed enstatite chondrites to be the main source of Earth’s nitrogen. Nevertheless, most diamond populations with Archean ages define a δ15N range of −12 to +5 ‰, with a mode around −5 ‰ (Cartigny et al., 2009), indicating no obvious secular change in mantle δ15N and thus limited nitrogen recycling compared to the nitrogen abundance in the mantle. The oceanic island basalts (OIBs), thought to be derived from the lower mantle (e.g., Shen et al., 1998; Stuart et al., 2003), have δ15N of −2 to +8 ‰, with a mean value of about +3 ‰ (Dauphas and Marty, 1999; Marty and Dauphas, 2003). Therefore the positive δ15N values of OIBs were interpreted to be results of addition of recycled sediments to the OIB source region (Dauphas and Marty, 1999; Marty and Dauphas, 2003). The Earth’s deep mantle below 250 km is reducing with oxygen fugacity lower than the iron-wüstite buffer (Frost and McCammon, 2008). Recent experimental studies (Frost et al., 2004; Rohrbach and Schmidt, 2011) suggest that about 1 wt. % Fe-rich metal may be stable in the mantle below this depth, because of the incorporation of significant Fe3+ in majoritic garnet and bridgmanite according to the disproportion reaction 3Fe2+ = 2Fe3+ + Fe0, which produces metallic Fe. For different δ15NBE values that represent the δ15N range of enstatite chondrites (Grady et al., 1986), this model implies that core-mantle separation may cause a significant increase in δ15Nmantle and may reproduce the δ15Nmantle range, if DNmetal/silicate is between 5 and 20 (Fig. 3). Figure 3 [...] Three different δ15NBE values are used: the lowest value (−45 ‰) is the lowest value observed so far for Earth’s mantle and enstatite chondrites (Grady et al., 1986; Palot et al., 2012); the values of −25 ‰ and −15 ‰ correspond to the average and highest δ15N values of enstatite chondrites (Grady et al., 1986), respectively. The trend in Figure 1 can be rationalised if one assumes that under these very reducing conditions below the iron-wüstite buffer, nitrogen is mostly dissolved as N3- ion in the silicate melt (Kadik et al., 2011, 2013; Li et al., 2015), while it dissolves as interstitial N atoms in the metal (Häglund et al., 1993). The fractionation of light element isotopes in this model can best be described by the Rayleigh distillation model (Wood et al., 2013; Horita and Polyakov, 2015): δ15Nmantle = δ15NBE + Δ15Nmetal-silicate × lnƒNmantle where ƒNmantle is the remaining fraction of nitrogen in the silicate mantle just after complete core-mantle separation. Nitrogen isotopes may constrain the origin of terrestrial volatiles (Javoy, 1997; Marty, 2012), as well as the evolution and interaction of different terrestrial reservoirs (Marty and Dauphas, 2003). Our above calculations demonstrate that: (1) the bulk Earth δ15N value has to be significantly negative to produce the present-day mantle δ15N of −5 ‰; (2) core-mantle separation alone may be sufficient to cause the present-day mantle δ15N of −5 ‰ even if the Earth accreted only from the enstatite chondrites, if the Rayleigh model is used for describing the segregation of nitrogen in Earth’s core; (3) as has been suggested previously (Javoy, 1997), a small fraction of carbonaceous chondrites with δ15N of +15 to +55 ‰ may have to be added to the Earth to achieve the present-day mantle δ15N of −5 ‰, if the Earth accreted mainly from enstatite chondrites and if the equilibrium or the hybrid Rayleigh-equilibrium model is used for describing the segregation of nitrogen in Earth’s core. These results are also consistent with several other isotopic systems that point towards enstatite chondrites as a main source of the material from which the Earth formed (Javoy, 1997; Trinquier et al., 2007; Regelous et al., 2008; Javoy et al., 2010). However, considering that nitrogen solubility in reduced silicate melt ranges up to a few wt. % (Kadik et al., 2011, 2013; Roskosz et al., 2013) and only a few hundred ppm nitrogen was present in our silicate melt, partial crystallisation during quench may not have caused exsolution of nitrogen. Figure 1 [...] The published DNmetal/silicate data (Kadik et al., 2011, 2013; Roskosz et al., 2013) are plotted for comparison. The high end of these CNBE values may be higher than the nitrogen concentration in any known chondrites (Krot et al., 2014), which thus indicates that a hybrid Rayleigh-equilibrium model may be more realistic for the segregation of nitrogen in Earth’s core if DNmetal/silicate is 15-20. The first one is the single stage model or equilibrium model, in which chemical equilibrium between the core and the mantle is thought to be achieved at certain P-T conditions at the base of the magma ocean (Li and Agee, 1996; Righter, 2011). Li et al. (2013) show that the silicate mantle may still contain an amount of nitrogen one to two orders of magnitude larger than the present atmospheric reservoir. The moderately siderophile nature of nitrogen together with the relatively low nitrogen solubility in mantle minerals (Li et al., 2013) implies that 1 wt. % Fe-rich metal may store more than 99 % of the nitrogen in the deep mantle. In this case, if the CNmantle of 0.8 ppm constrained by Marty (2012) is used, then the CNcore would be 4-16 ppm. Using the CNmantle of 0.8 ppm by Marty (2012) and a DNmetal/silicate of 5-15, the calculated CNBE is 4-220 ppm (excluding surface nitrogen) and the CNcore is 10-660 ppm. The CNBE required to achieve the CNmantle of 0.8 ppm by Marty (2012) would be about 40 ppm. O'Neill, H.S.C., Eggins, S.M. (2002) The effect of melt composition on trace element partitioning: an experimental investigation of the activity coefficients of FeO, NiO, CoO, MoO2 and MoO3 in silicate melts. Chemical Geology 186, 151-181. Table 1 [...] Calculation of logƒO2(ΔIW) was performed assuming γFeO = 1.2 in the silicate melt (O'Neill and Eggins, 2002) and ideal solution of liquid Fe-C-Pt-N metal (γFe = 1). However, diamonds derived from the mantle transition zone and lower mantle show similar δ15N values to the upper mantle (Palot et al., 2012). Partial melting of the deep mantle with δ15N of −5 ‰, in the presence of 0.5 to 1.5 wt. % Fe-rich metal (Rohrbach et al., 2014), may therefore generate OIBs with very slightly positive δ15N values; however, generating OIBs with δ15N up to +8 ‰ may need the source region δ15N > +0 ‰. A significant fraction of nitrogen may have been segregated into the core during core-mantle separation (Roskosz et al., 2013). Such a hybrid model (Rubie et al., 2015) assumes that during the early stages of accretion, the impacting objects are relatively small and their metal phase sequentially extracts nitrogen from the magma ocean according to a Rayleigh model; however, towards the end of accretion, large, differentiated planetesimals collide with the growing Earth. According to Rubie et al. (2015), 80-100 % of the core-forming metal may have equilibrated with the silicate magma ocean according to the Rayleigh model. The second endmember mode is the continuous core formation model (Wood et al., 2006, 2013). Starting materials for high-pressure experiments included high-purity iron powder, ammonium nitrate (NH4NO3), and a synthetic silicate glass with a chemical composition similar to that of the global MORB. A mixture of iron powder and finely-ground silicate glass was loaded together with about 0.1 to 1.5 wt. % ammonium nitrate into a graphite-lined platinum capsule. Experiments were conducted at 1.5 to 7.0 GPa and 1600 to 1800 °C in a piston cylinder or multi-anvil high-pressure apparatus, such that only liquid Fe-rich metal and basaltic melt were coexisting in the sample charge. Experiments were quenched to room temperature within a few seconds after about 90 mins. The coexisting Fe-rich metal and silicate of the recovered samples were carefully separated for analyses of nitrogen concentration and isotopic composition, using a static gas mass spectrometer. Humbert, F., Libourel, G., France-Lanord, C., Zimmermann, L., Marty, B. (2000) CO2-laser extraction-static mass spectrometry analysis of ultra-low concentrations of nitrogen in silicates. Geostandards Newsletter 24, 255-260. ). Potential CO contamination, checked with the measured 29/30 ratio, was found to be always negligible. The abundances of nitrogen and the 15N/14N ratios were then computed from the data and from runs with our in-house N2 standard (purified atmospheric N2). Blanks were found to be less than 0.1 % of the signals for all runs. Errors on the isotopic ratios are computed from the standard deviation of in-house N2 standard runs and from the internal precision of the respective sample runs. Nitrogen metal/silicate partition coefficients DNmetal/silicate were calculated according to DNmetal/silicate = CNmetal/CNsilicate , where CNmetal and CNsilicate are the nitrogen concentrations in the liquid Fe-rich metal and silicate melt, respectively. 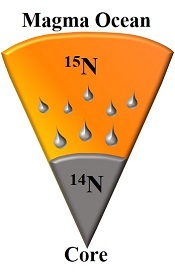 Nitrogen metal/silicate isotope fractionation Δ15Nmetal-silicate was calculated according to Δ15Nmetal-silicate = Δ15Nmetal - Δ15Nsilicate, where Δ15Nmetal and Δ15Nsilicate are the nitrogen isotopic composition of the liquid Fe-rich metal and silicate melt, respectively. All the major and minor elements were measured by electron microprobe. 1-σ is the standard deviation based on replicate analyses of 10-20 spots. The Pt in the metal is due to contamination by the Pt capsule used. Purified N2 was then introduced in a static mass spectrometer where masses 28 and 29 were analysed on a Faraday cup detector and masses 29 and 30 were counted on an electron multiplier (Humbert et al., 2000).